In my previous JTable Video Tutorial I showed you how to pull information from a database and work with it in a JTable. In this tutorial I show you how to add and delete rows in a JTable that will then effect the database. I also cover allowing the user to change the database on a cell basis. 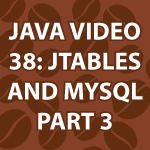 After this tutorial, you’ll be able to do anything with Java JTables. great job, those Java/Swing videos! You are almost at the level of Paul Hagerty’s lectures on iOS that is available on iTunes U. One topic that I was looking for and couldn’t find so far: The overall structure of a MVC based swing application. What components take over what duties, what are the typical interfaces, visibility between the components etc. Wouldn’t that be a nice topic for you? Our can you highlight me a resource? I’m going to cover most of the most popular design patterns very soon. You can expect that tutorial to start next week. I’m sure the Stanford tutorials must be good. I don’t watch anyone else though, because I don’t want to be influenced by them. Very soon I’ll completely change the way I do tutorials. I want them to be more fun. I figure that is the only way I can improve. More fun is always good! Although I must admit your tutorials are the best quality I have seen so far: seeing you typing the things keeps the mental flow in sync, the production quality and layout are really professional! Thank you very much. I’m not sure how I can improve them. Not that I think they are perfect, but I’ve been perplexed by why I don’t get more views? I guess I spend very little time on marketing / networking and that is the reason. This is all just a fun hobby and definitely not even a part time job. if possible make some videos for logging in java.. Thanks for making such a wonderful website. You are the man who is really helping student like me. From my very early age I am planning to make a desktop application for super shop management. But I am not getting proper guideline to make my dream successful. I have some knowledge in java. Would you please give me guideline about how to get started and what I need to learn , from where I could learn etc . I am knew to the world of java programming and find your videos very helpful. form to update and delete a field in the database. You are very welcome. I’m glad to help. I pretty much covered Java Jlists here. I then show how to query databases with Java here. There is more information on Java and MySQL here. In this tutorial JTables and MySQL, I show how to delete information from the database using Swing components. If I didn’t cover what you need feel free to ask. I’m going to revisit JTables, MySQL and sabermetrics soon. I’m going to make an app that has multiple JTables that work together. Yes Derek I’ve been playing around with your base code and can now put things together. Thanks. Very Nice video. I follow your code.. it works well without any errors. But there is a little thing about deleting rows. when I select a row and press “remove” button. In the swing interface the selected row is deleted (as expected). In the actual database the last row is deleted whatever the selected row was (not expected). Admin.. I am sorry about the previous comment, I didn’t know that I should be logged in to see it. Ok here is the solution to my problem. >I’m going to make an app that has multiple JTables that work >together. It will be nice if you can cover that. Invalid cursor state – no current row. I solved the problem with direct SQL statement. But you code for the add button doesnt work for me. Not sure why. I think it looks to initialize the cursor position. I have a question about synchronizing between the database and Jtable, I been playing around this example. the Id number would always skip over the expected sequent order when I entered a new record by adding a record. e.g,if there are only 2 records in the database, the new inserted row’s ID should be 3, it turned out to be 18 or other number instead, depending on how many operations I had done in between. it seems that java could memorize the number of time that i had added or removed the record. I couldn’t figure it out how to fix it. what is the general approach to synchronise with database? Hi Derek, I’ve been trying your code and I can add/remove information but when I try to change the cells the only cell that I’m available the edit and see in the database is “state”.